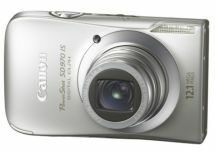 Canon will launch Canon PowerShot SD970 IS Digital ELPH Camera soon. The camera is featured with Zoom Blur and Creative Light Effect that able to produce viagra online canada pharmacy fun and original effects. Zoom Blur allows the user to zoom during exposure, thus providing a haze-like effect to the image. While, Creative Light Effect allows the user to shoot pictures by converting the light from light bulbs and sparks from fireworks into various shapes, such as stars and hearts. Featured with large 3.0 inch Pure Color LCD II screen, PowerShot SD970 IS Digital ELPH Camera is also equipped with 12.1-megapixel camera and 5 X Optical Zoom lens with Optical Image Stabilization. Additionally, it also integrated with other features include Blink Detection Technology, Active Display, Smart Auto and 729p HD movie mode with built in HDMI connector to view photos and videos on an HDTV.